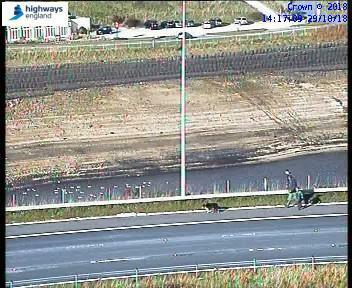 A farmer and his dog was deployed by Highway England traffic officers to help clear sheep off the M62. Sheep were grazing on the side of the M62 junction 22 to 23 at 1:50pm on Monday (29 October), with Highway England mulling a possible closure of the motorway. Traffic officers eventually stopped the traffic, and a farmer and his sheep dog were called on to help collect the sheep and move them to safety. The motorway is one of the UK's busiest, with an average daily traffic flow of 144,000 vehicles. Highway England used Twitter to confirm that the matter had been resolved: "J22 to J23 - The dog and farmer have done some amazing work. Sheep collected and returned to field. All traffic has been released. Thanks for your patience." It is not the first time livestock have disrupted traffic on Britain's roads. Around the 2017 Christmas period, dozens of turkeys were left on the road after a lorry jackknifed near Driffield, in East Yorkshire. Sometimes it isn't livestock that disrupts traffic, but agricultural machinery. In July, a tractor spilt six tonnes of grass from its trailer when it overturned onto a motorway in Scotland.